“RHIC’s collisions of heavy nuclei at nearly light speed are designed to re-create, on a tiny scale, the conditions of the early universe. 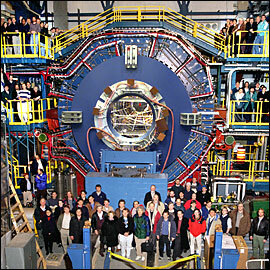 These new results thus suggest that RHIC may have a unique opportunity to test in the laboratory some crucial features of symmetry-altering bubbles speculated to have played important roles in the evolution of the infant universe,” said Steven Vigdor, Brookhaven’s Associate Laboratory Director for Nuclear and Particle Physics, who oversees research at RHIC. Physicists have predicted an increasing probability of finding such bubbles, or local regions, of “broken” symmetry at extreme temperatures near transitions from one phase of matter to another. According to the predictions, the matter inside these bubbles would exhibit different symmetries — or behavior under certain simple transformations of space, time, and particle types — than the surrounding matter. In addition to the symmetry violations probed at RHIC, scientists have postulated that analogous symmetry-altering bubbles created at an even earlier time in the universe helped to establish the preference for matter over antimatter in our world. RHIC’s most energetic collisions create the kind of extreme conditions that might be just right for producing such local regions of altered symmetry: A temperature of several trillion degrees Celsius, or about 250,000* times hotter than the center of the Sun, and a transition to a new phase of nuclear matter known as quark-gluon plasma. Furthermore, as the colliding nuclei pass near each other, they produce an ultra-strong magnetic field that facilitates detecting effects of the altered symmetry. Now, early data from RHIC’s STAR detector hint at a violation in what is known as mirror symmetry, or parity. This rule of symmetry suggests that events should occur in exactly the same way whether seen directly or in a mirror, with no directional dependence. But STAR has observed an asymmetric charge separation in particles emerging from all but the most head-on collisions at RHIC: The observations suggest that positively charged quarks may prefer to emerge parallel to the magnetic field in a given collision event, while negatively charged quarks prefer to emerge in the opposite direction. Because this preference would appear reversed if the situation were reflected through a mirror, it appears to violate mirror symmetry. At RHIC, the parity-violating bubbles are formed in a random way, possibly with oppositely oriented charge separation in bubbles at different locations. Averaged over many events there would appear to be no parity violation, even though there were violations locally in each event. Although allowed by quantum chromodynamics (QCD), the underlying theory that describes the strong nuclear force, such local strong parity violation has never been detected directly. “The key to observing the effect in high-energy nuclear collisions is to study correlations among the particles emerging from the collision,” said Nu Xu of Lawrence Berkeley National Laboratory, the spokesperson for the STAR collaboration. The theory suggests that particles with the same sign of electric charge should tend to be emitted from such local parity-violating regions in the same direction, either both parallel, or both anti-parallel, to the magnetic field arising in the collision, whereas unlike-sign particles should be emitted in opposite directions. “We have observed a correlation among emitted charged particles of the predicted type, with the degree of directional preference increasing as the collisions vary from head-on to more grazing,” Xu said. STAR data also suggest the local breaking of another form of symmetry, known as charge-parity, or CP, invariance. According to this fundamental physics principle, when energy is converted to mass or vice-versa according to Einstein’s famous E=mc2 equation, equal numbers of particles and oppositely charged antiparticles must be created or annihilated. If CP symmetry had not been broken at some very early time in the evolution of our universe, the particles and antiparticles created in equal numbers in the Big Bang would subsequently have annihilated one another in pairs, leaving no matter to form the stars, planets, and people that now populate our world. While some small violations of CP symmetry have been found in previous laboratory experiments, those violations are far too weak to account for the amount of matter remaining in the universe today. Likewise, the signs of possible local CP violation at STAR cannot explain the global predominance of matter in today’s world, but they may offer insight into how such symmetry violations occur. Research at RHIC is funded primarily by the U.S. Department of Energy’s Office of Science and by various national and international collaborating institutions. For a complete list of RHIC funders, go to: http://www.bnl.gov/rhic/funding.asp.